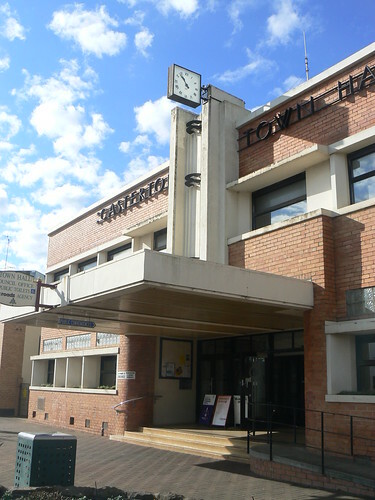 Casterton Town Hall was designed by A C Leith and construction was completed in 1937. 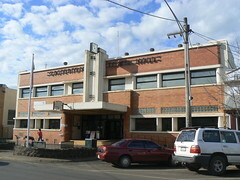 Casterton is now part of Glenelg Shire with the main civic centre in Portland but for many years the building served as both Town Hall and as a cinema for the town. It is at odds with most of the older buildings in the town that date from almost 100 years earlier but it does have some contemporaries such as Murrells Shoes, directly opposite, and Electra House a little bit further along Henty St. It seems to me that there us a flagpole missing from the building above the main entrance but perhaps it was designed that way. 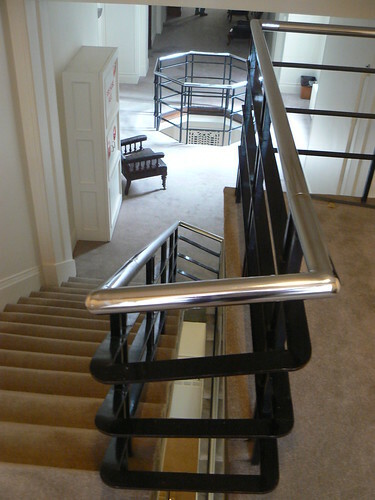 The foyer has series of Art Deco lights and some nice metalwork in the railings of the stairs to the upper floor. This shoe shop in Casterton tells an interesting story of retail in a small western Victoria town. 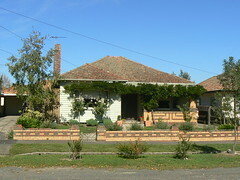 Casterton was founded in the 1840s as a crossing to the Glenelg River and many of the buildings in the main street date from the nineteenth century. 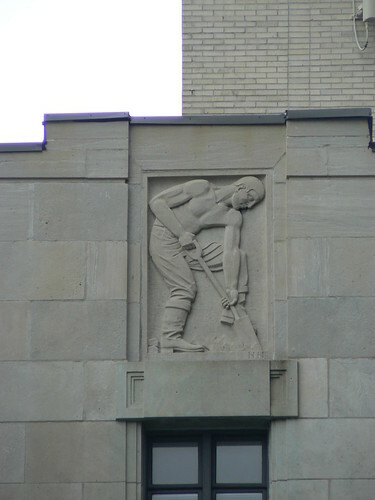 But in the 1930s, they built a new town hall in moderne style and Williams the Shoeman followed suit. 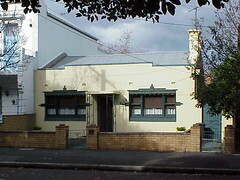 According to the current owner, around 1940, the shoe company purchased half of a double fronted shop dating from the early 20th century and built this shop with a panel of glass bricks, just like the town hall across the road, above the verandah. 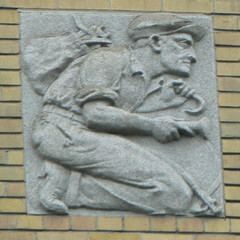 At the time, they would have been the two most modern buildings in the street and Williams would no doubt have promoted his business as such. 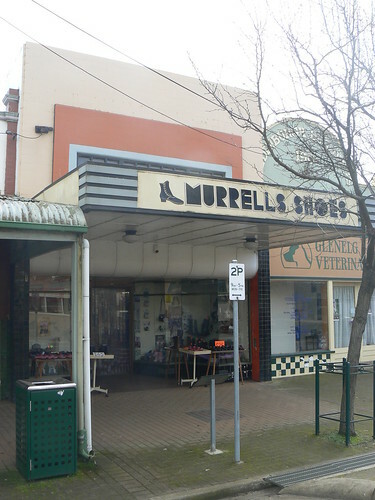 Since 1996, the shop has been owned and run by Brian and Vicki Murrell who run the business under the name Murrells Shoes and from my conversation today, they are proud of their Art Deco shop and its place in Casterton. 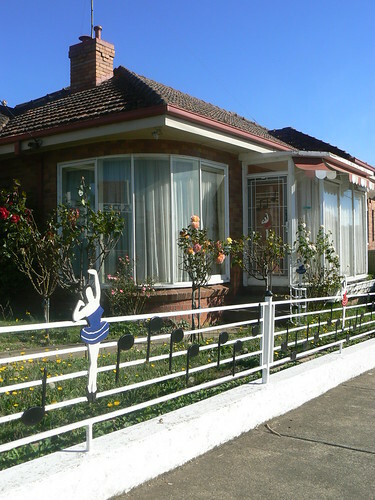 I'm not sure exactly what to make of this house in Port Melbourne. From the distance it looks like so many single-storey double-fronted houses in the area. Certainly the corrugated iron pitched roof and the chimneys could be from the mid 19th Century but the front is deco. There is a small step in the roofline and thin bricks in a stepped pattern on the sides and tops of the windows. I wish I knew someone at the Port Melbourne Historical and Preservation Society who could do some research on the house and perhaps unravel some of the mystery. Hang on a minute, I do know someone ... me!!! I'll report back if I find anything. 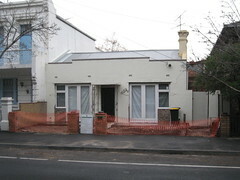 I dropped past this house today and was surprised to find that it is currently undergoing the next stage of its evolution. 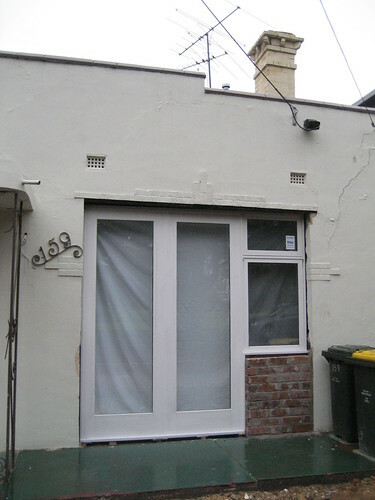 The old windows are being replaced with french doors with a small window off to the side. 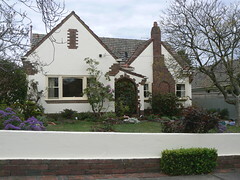 The decorative bricks around the windows have been kept but are now painted the same colour as the rest of the house. The low wall is gone and I suspect they will build a much taller wall to create a courtyard at the front of the house with the french doors opening onto it. 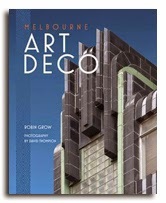 Today during Melbourne Open House I visited the former High Court Building in search of some Art Deco. 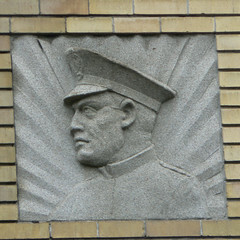 The court building was originally designed by John Smith Murdoch and completed in 1928. A second storey was added in 1935 by H J MacKennal and it is here that I found some fixtures very much to my taste. 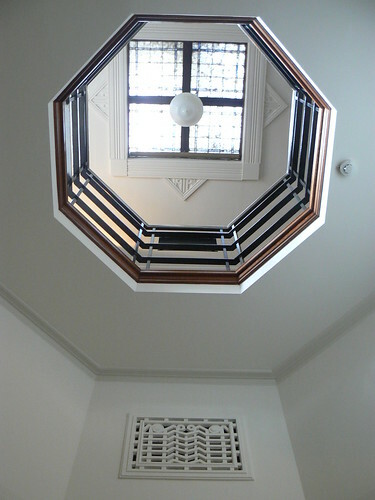 The vent shown on the left is one of eight, four each on two octagonal light wells breaking through the upper floor. 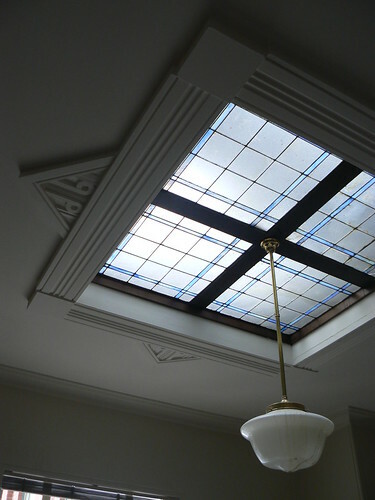 On the second floor the skylight and light fixture are bordered with simple geometric patterns. 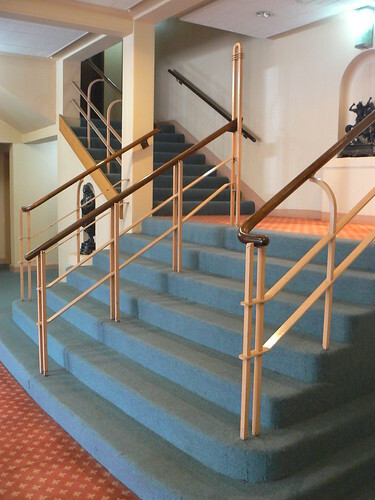 I think the lines of the metal railings on the stairs and the tubular steel handrail are my favourite fixture. 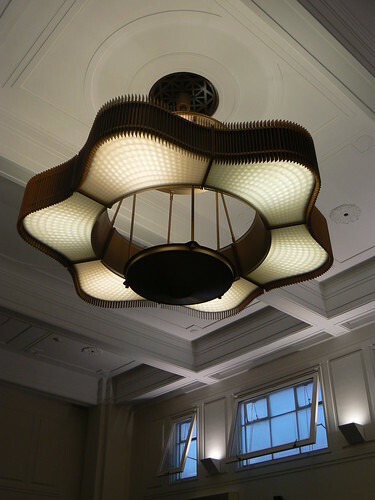 By the time I got downstairs, they had opened Court Room 3 which has this extraordinary central light fixture. Federal Court of Australia, Victorian Heritage Database. 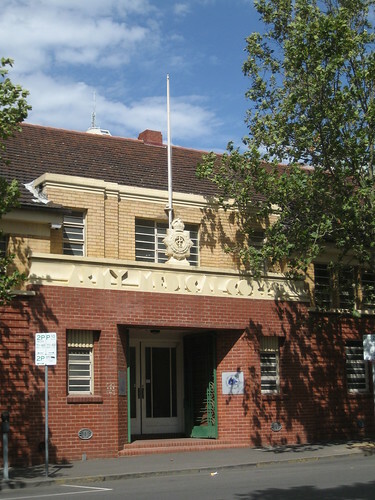 I've written previously about the Royal Historical Society of Victoria (RHSV) in A'Beckett St but today I took the opportunity to re-visit this 1938 former Australian Army Medical Corps building by architect George Hallendal as part of the Melbourne Open House weekend. Firstly there was the added benefit of the exhibition marking the 100th anniversary of Flinders St Station based on Jenny Davies book, Beyond the Façade. 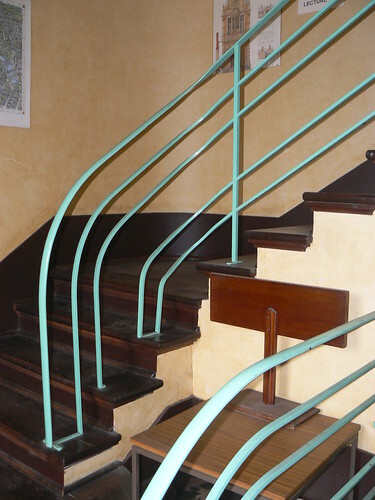 But it is the Art Deco features, especially in the former Mess Hall upstairs, that drew me back. 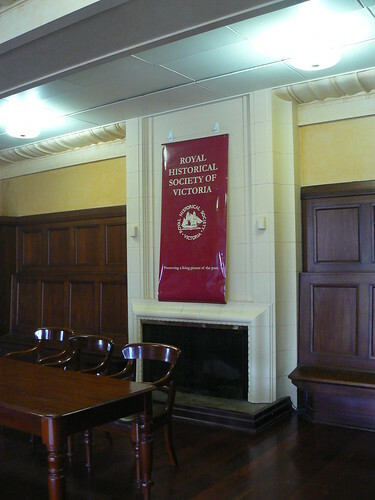 The former Mess Hall is now used by RHSV as a meeting space. 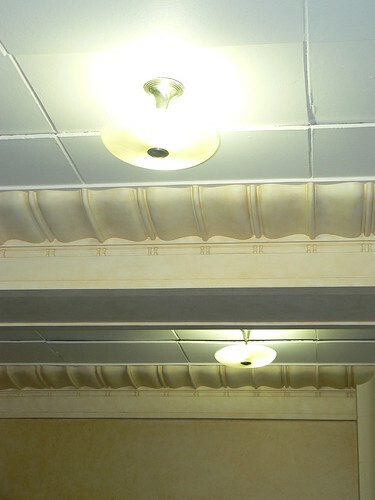 The simple decoration includes these scallop elements either side of the ceiling beams and the 'cake stand' lights. 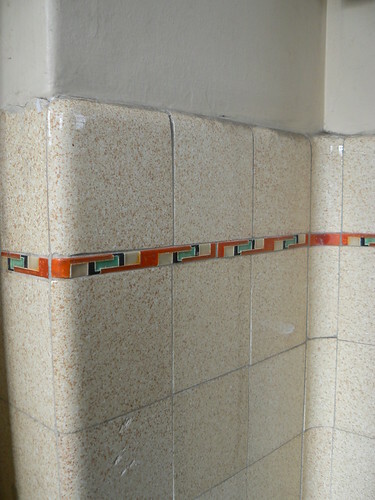 Melbourne Open House continues tomorrow with about 60 buildings open to the public and if you go to the RHSV building, don't miss the small toilet off the Mess Hall and check out the glorious orange Art Deco tiles. 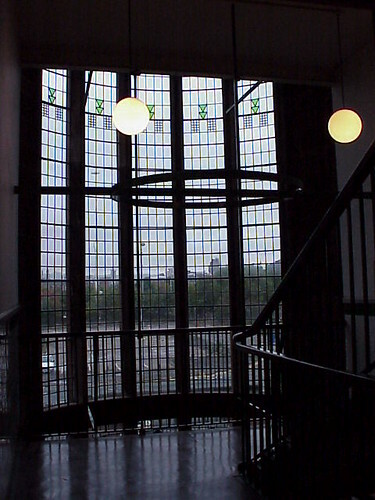 I do like the work of Glasgow architect and designer Charles Rennie Mackintosh. 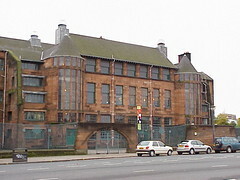 This is Scotland Street School designed 1904 and 1906. 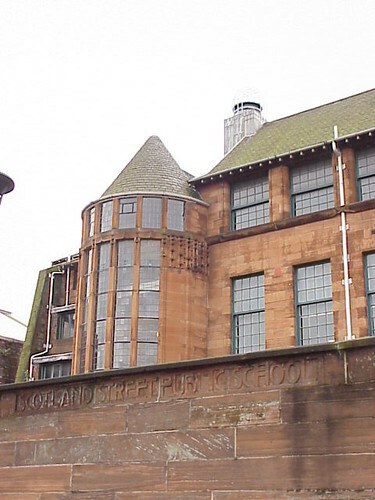 Mackintosh liked to include aspects of Scottish castles in his designs and in this school he has placed the stairwells in two circular towers, one at each end of the building. 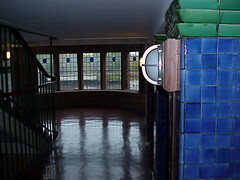 The towers mark the separate entrances for boys and girls with a entrance specifically for infants in between. Somewhat surprisingly there are blue and green coloured tiles inside contrasting to the red sandstone exterior. 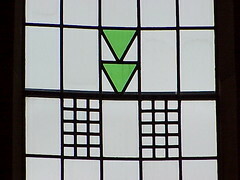 These colours have also been used in the patterns of leadlight glass. I really like the simple pattern high in the curved windows of the towers consisting of two green triangles, standing on their points one on top of the other, combined with two glass panels split into a regular grid. This pattern is repeated across the windows in a horizontal band leaving the bulk of the area as clear glass. I find it very appealing. There are many weatherboard houses in Australia that look more or less like this one. Those for earlier times often have corrugated tin roofs but this one has tiles. It also has a lovely low brick wall using different colours to create an interesting pattern. My favourite part of the house, however, is the wall at the front of the verandah with a simple Art Deco motif created with dark bricks against the cream colour of the background wall. 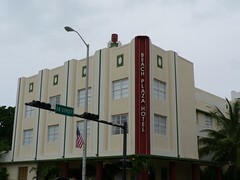 The Beach Plaza Hotel at the corner of 14th Street and Collins Avenue in Miami South Beach was designed by L Murray Dixon in 1935. 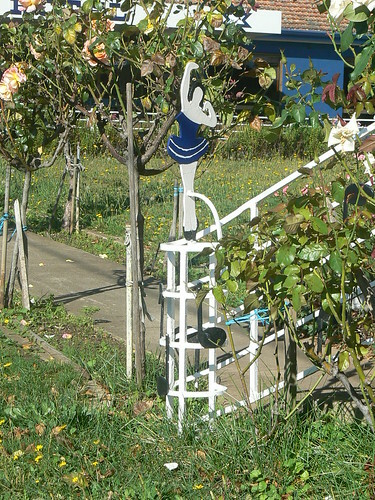 The design is quite simple with little decoration. The windows are set back between flat bulky columns and each space has a panel, just below the roofline, with a pattern made up of squares and rectangles. The corner column bears the Beach Plaza Hotel name and a tower on the roof draws further attention to the hotel. 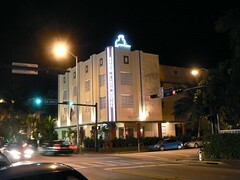 Like many South Beach hotels, the exterior is illuminated with strips of neon giving a completely different look after dark. I've always liked this house in Ballarat. It has a deco feel to it. The two rooms at the front of the house have rounded corners and rounded windows but it is the fence that is the real killer for me. It consists of black musical notes and ballerinas in red, blue, green and yellow. I can't read music so I don't know if the notes are a particular tune or just for the design. 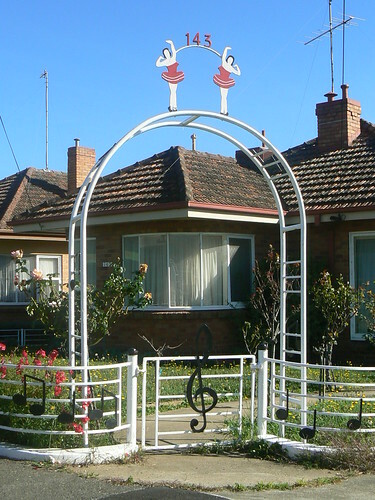 The small gate bears a large treble cleft and the arch above the gate carries more notes and a pair of ballerinas holding the street number. 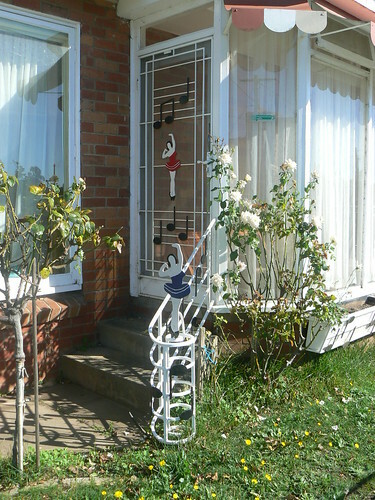 The wire-screen door, of course, has more musical notes and a dancer in red while the metal railing leading to the door features a pirouetting ballerina in blue. 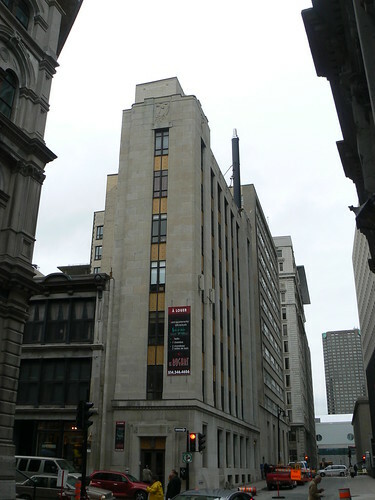 The McDougall and Cowans Building (1929) sits on this narrow siter at the corner of Notre Dame and Saint Francois-Xavier Streets in Montreal. 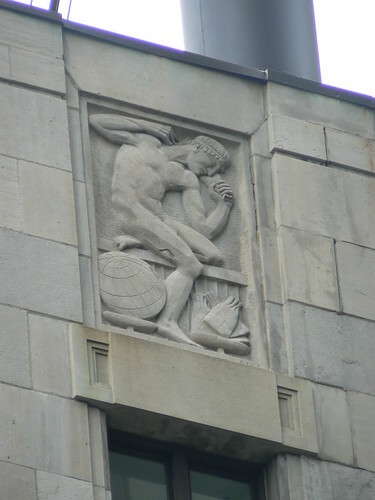 Architect, J Cecil McDougall designed the building squeezing seven storeys into its compact bulk. 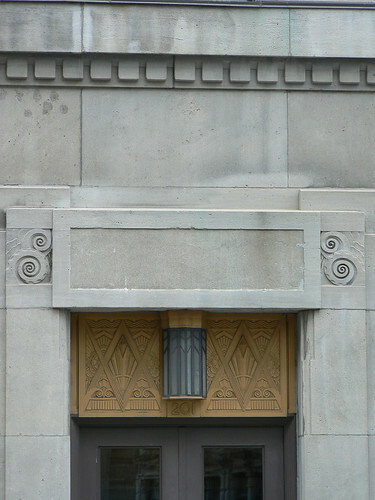 The doorway on the Notre Dame facade is marked by two simple swirls in the concrete but has a much more elaborate Art Deco panel and light directly above the door. 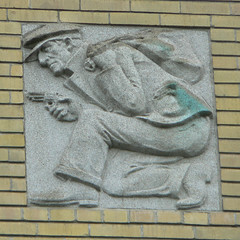 At roof level, there are three large panels bearing reliefs by Henri Hébert. 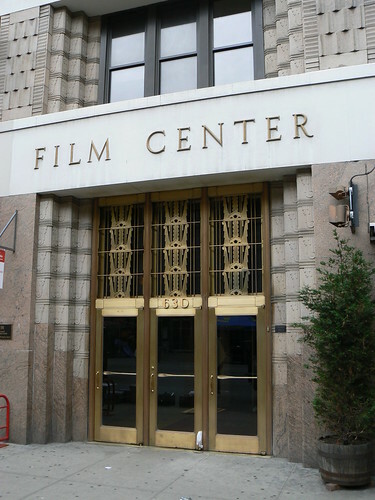 The Film Center Building at 630 Ninth Avenue, NYC was designed by Ely Jacques Khan and constructed 1928-29. 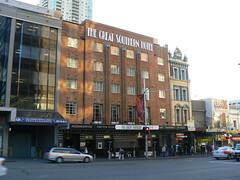 Above the main doorway is set back from street level with the sides stepping back into the facade of the building. 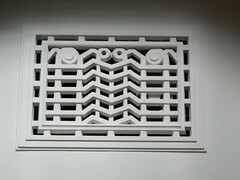 The decoration in the stonework around the doorway is similar but not identical to the patterns in the metal grill above the doors. 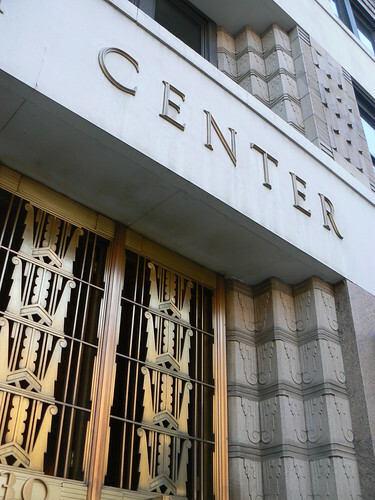 But it is the interior of this building that is so striking and it is the interior that was recognised by the New York Landmarks Preservation Commission in the 1980s. The listing document specifically mentions many of the elements in the foyer, including the mailbox, directory board and elevator doors. 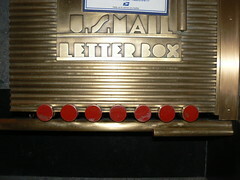 The photo on the left shows the bottom part of the mail box with wonderful Art Deco lettering and a series of red discs as part of the decoration. 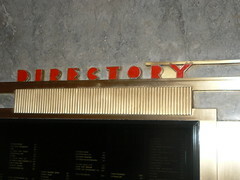 The photo on the right shows the top of the directory board with the same style of lettering used but as opposed to the letterbox, the letters themselves are coloured red. 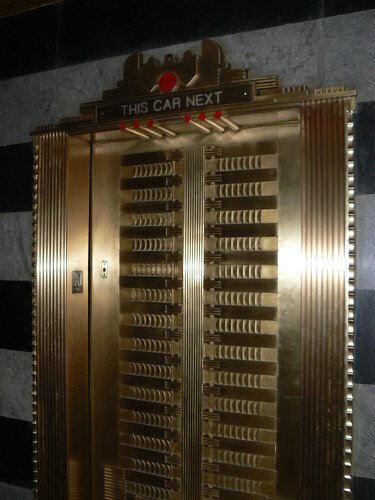 The elevators are marked with vertical lines either side contrasting with the horizontal banding on the foyer walls and the horizontal decoration on the actual elevator doors. 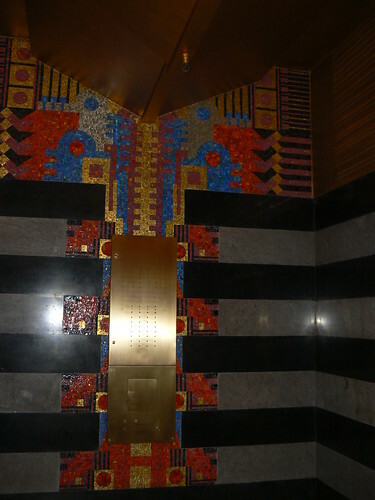 A decoration made up of geometric shapes, incorporing six red capped cylinders and a single red disc in the middle of the composition, sits, centered, above the elevator door. Elsewhere in the foyer the decoration takes the form of an abstract mosiac featuring reds, blues, golds and silvers. 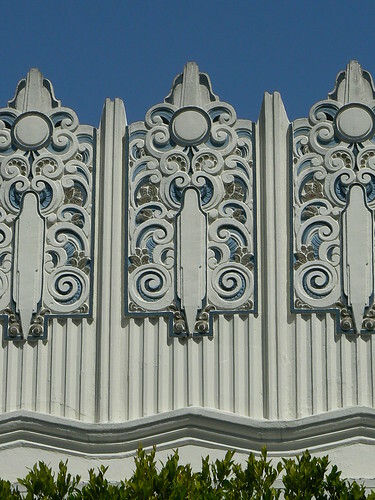 There is no doubt this is one of the best intact Art Deco interiors in New York City. 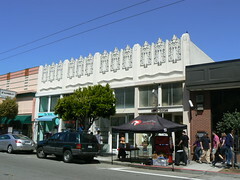 Chestnut St in Marina is awash with small commercial buildings in various Art Deco styles. 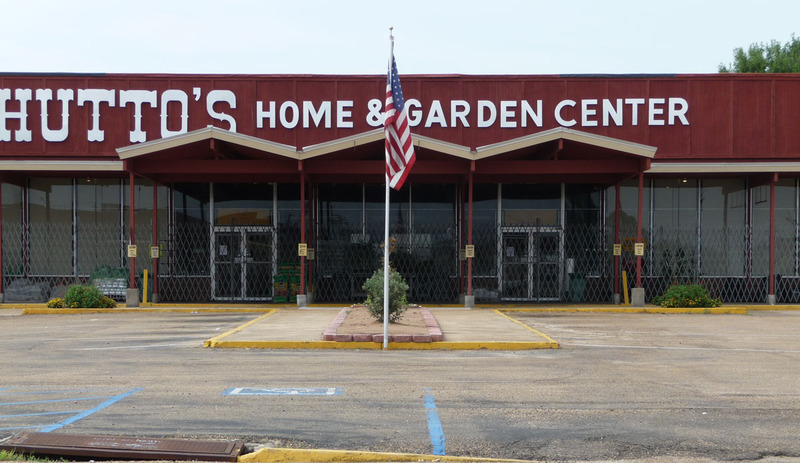 This is one building with four shopfronts. 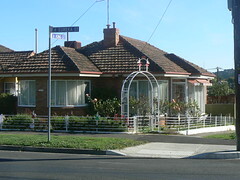 I've previously written several posts about the Golf Links Estate in the Melbourne suburb of Camberwell. The estate, as you may have guessed, is a wonderful pocket of interwar houses on a former golf course. This house shows a great use of bricks as highlights and decoration. Look at the detail in the chimney and the keystone effects around the arched entrance. The eaves, both at the main roof and the small porch roof, are decorated with bricks and there are several rows of small bricks below the windows. 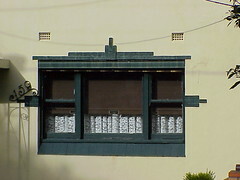 The low rendered wall has a healthy foundation of bricks and finally there is that feature decoration above the window. 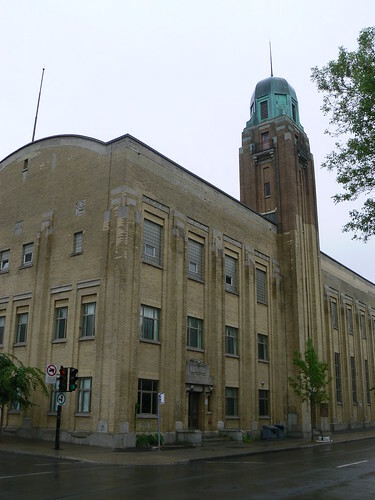 This is large complex is the Police and Fire Station No 11 in Montreal but for some extremely wierd twist of Canadian logic it is now Police and Fire Station No 23. It has a large No 11 on the outside but has fallen down the hit parade of Police and Fire Stations to 23. On my hit parade it is definitely top ten. 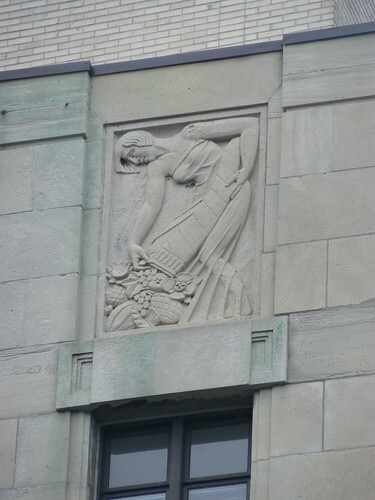 It was designed in 1933 by Ludger Lemieux but the highlights of this building are the reliefs on the exterior walls by Joseph Guardo. 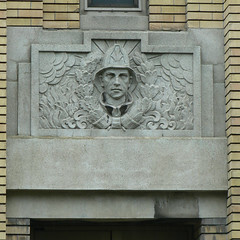 Above a side doorway there is a wonderful relief of a fireman's head surrounded by stylised representations of smoke, fire and water. 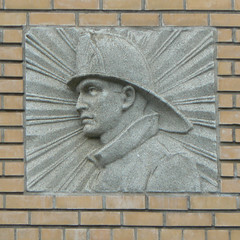 Elsewhere there are the heads of a policeman and a fireman, each on a background of radiating rays. Then there is this trio of theives. 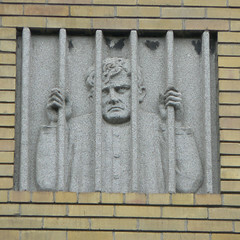 Two in the act of the crime and one serving his sentence behind bars.